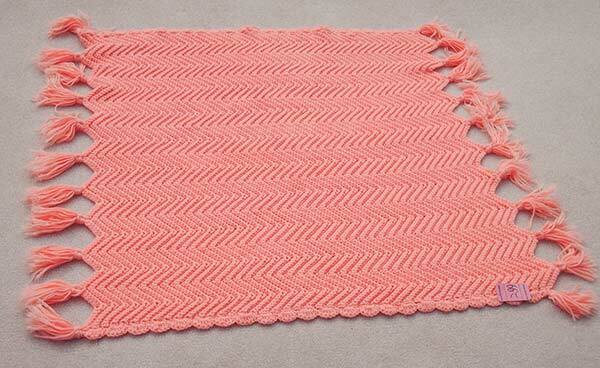 This is the second ripple I’ve made with the peach yarn I harvested from a $1.50 thrift store find. The first was Peach Melba. Peachy! Tiger is rather shocking in comparison. Its wide stripes seem to move about in a disturbed jarring sort of way that I don’t much care for. I tried something different, using what I call a rolling stripe pattern instead of a simple repeating one. Let me explain. Just ignore the variegated yarn for the moment; a single row of it comes after every solid stripe and isn’t a part of the rolling pattern. That leaves the three solid colors of yarn: brown, rust, and peach. Usually I choose a particular order for them, like rust, brown, peach, and then just repeat that sequence over and over: rust, brown, peach – rst, brwn, pch – rbp – rbp – rbp, etc. Instead, in Peachy! Tiger, I went rust, brown, peach, then brown, peach, rust, followed by peach, rust, brown, then I began again. In ‘stripe sequence shorthand’ this reads: rbp, bpr, prb, – rbp, bpr, prb, etc., which ends up being its own looong repeating sequence. Hmmm, was that at least a little interesting to read about? lol. In conclusion, I think the ‘rolling stripe sequence thing’ probably works better with lots of different colors of yarn, not just three, and without the inclusion of such a strong variegated yarn. 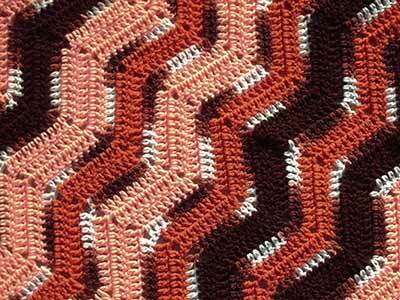 For those of you who like to know such things – the brown yarn is RHSS ‘Coffee’ and the rust is RHSS ‘Carrot’. There’s enough of the unknown variegated left for me to crochet seven more ripple rows, just enough to perk up another blanket! Maybe I’ll like that one better. This entry was posted in Ripple Afghans of 2013 and tagged charity project, crochet, crocheted blanket, Red Heart Super Saver, ripple afghan, variegated yarn. Bookmark the permalink. So glad your version came out well. I should really try the rolling sequence thing again some day. Maybe even this ripple’s tiger stripes will grow on me in time. . . but I doubt it! It’s so strange how strongly they affect me considering all the red, green and white ripples I just did for Christmas – my design teacher in college thought that was the most “maddening” color combination of them all!!! lol. I’m going to hang onto the rest of the variegated for a little while, hoping to gather a different set of yarns to put with it. I like it too. Not real relaxing, but might cheer up someone as a wheel chair throw or something like that. LOL “Not real relaxing” – you got that right!! I’m sure some little one is going to love your tiger blankie. You can usually depend on the fact that the more we dislike something the more a kid will love it. Ha! Personally I love it. Tiger colors are awesome. Tony the Tiger would probably say it’s Grrrrrreat!! lol. It sure will wake someone up!! Still I like it. Love ALL your ripples! Each one has it’s own personality, including this one. It is quite interesting to read about how you design your creations! I have been wondering about the reasons they are so diversified yet each one is so harmonious within it’s own state. Of course one reason is that you have done so many…experience is always the best teacher. Now you reveal one of your design secrets. Having said all this, you really have a gift for choosing color combinations from your large & prolific stash. For most that would lead to confusion, but for you it leads to excellence. Another lovely ghan! Thank You for such a kind and generous review of my ripples! You’ve also given me some valuable food for thought. 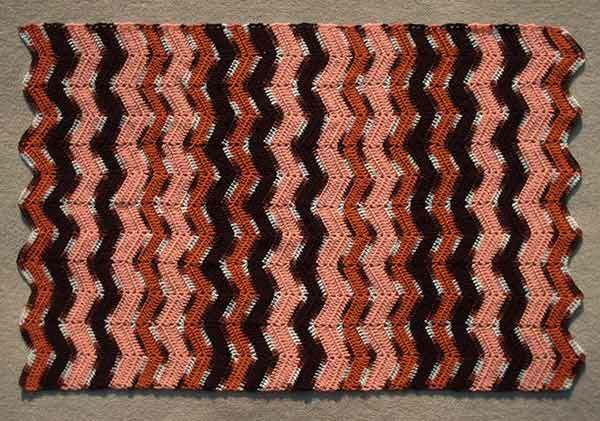 From what you said I think you might enjoy reading these two posts from the spring of 2011, ‘Choosing Colors and Stripes for #18‘ and ‘Beginning of #18‘. After all that, I suppose you’d also like to see the finished ripple, so here it is. lol. You’re right that I have a very wide variety of yarns in my charity stash, but, like in the mixed veg example, I only a few ounces of many of them. I’m sure that this makes me come up with far more creative striping plans (design solutions) than I would if I had multiple skeins of every yarn. Guess that’s why they say, ‘Necessity is the mother of invention’. hello Linda!!! another award for your lovely blog, please find it here http://wp.me/pGgxy-Ml, enjoy!! I really like your peachy tiger! 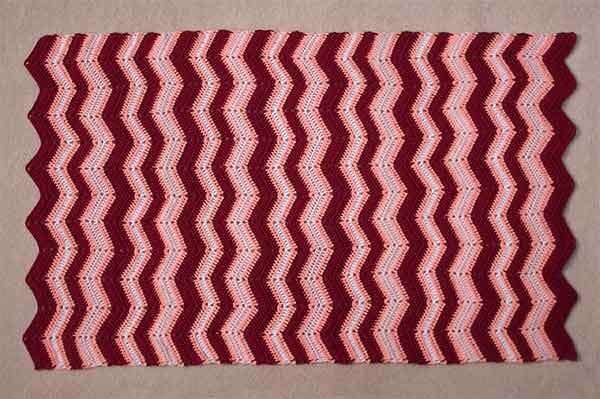 Another winner, though I admit the striping sequence isn’t quite the winner like most of your ripples, but it’s really nice to see something different so I still really like it. I still mainly do random stripes in mine. I like random stripes too, especially when I’m working out of the scrap box.